Your exterior signs say a lot about your organization or business. Sure, they tell motorists, passengers, and pedestrians what the name of your company is, but there are also non-verbal messages, such as your branding. If your marker is in disrepair, you might also be sending the negative message that your enterprise does not pay attention to details. 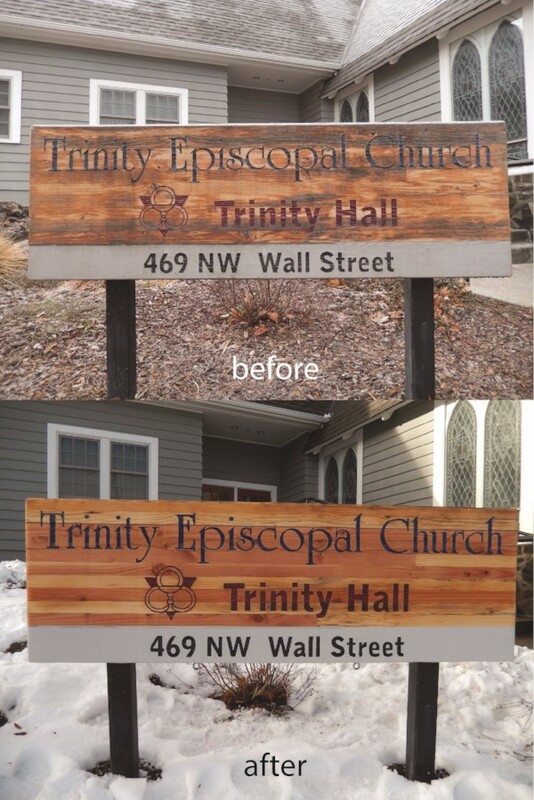 Trinity Episcopal Church wanted to present a positive image, so they contacted Blue Barrel Signs for sign refurbishing for churches in Bend, Oregon. What Is Trinity Episcopal Church? The before and after look! Located on Northwest Wall Street in Bend, Trinity Episcopal Church is a community of Christians who welcome diversity in worldviews and theology. Their mission is to minister to the physical, spiritual, emotional, and intellectual needs of all people. They do this by working in collaboration to address the needs of others, practicing forgiveness and radical generosity to all, and identifying and using their gifts to serve one another. Their services are Sundays at 8 am and 10:15 am and Wednesdays at noon. When an organization that does such a good job of seeing to the spiritual needs of local residents came to us for sign refurbishing for churches in Bend, Oregon, we were happy to help out. Trinity Episcopal had a monument sign that was technically still functioning, but it was starting to look quite shabby. Fortunately, we knew just what to do. Our first step in the sign refurbishing process is to check out the old sign and meet with the client to see what they want us to do. The sign is made out of wood, which you do not see too often in Bend these days because it does not seem to stand up against the weather too well. This sign had seen better days, but when you are celebrating the life of a carpenter, wood is the way to go! They simply wanted us to make the sign look like new again. We were able to salvage all of the sign. We simply sanded down or cleaned the entire marker and touched up the lettering. We did all of the work at a time when we would not disrupt services. In the end, Trinity Episcopal was thrilled with the job we did. Now, their monument sign gives passersby a positive impression of the church. Don’t Let Your Signs Reflect Poorly upon Your Organization! There have been a lot of innovations in the sign industry in recent years, but there are still no materials that last forever. This means that eventually, you will need to update your signs whether it is due to weather damage, rebranding, mergers, or any other reason. At Blue Barrel Signs, we stand by our commitment to the environment and to protect our clients’ bottom line. That is why we try to salvage as much material as we can when updating signage. Are your markers presenting an inaccurate image of your business? If so, contact Blue Barrel Signs today for our sign refurbishing services.